Euronav NV today reported its final financial results for the full year to 31 December 2017. Paddy Rodgers, CEO of Euronav said: “From an operational perspective, 2017 was a challenging year for Euronav. The concentrated delivery schedule of new tonnage coupled with restricted crude supply from extended OPEC production cuts maintained freight rates at low levels throughout the year. Despite these headwinds, demand for oil continued to remain robust and above long-term trend boosted by rising global economic growth and a supportive oil price structure. Elsewhere, we were active with the confirmation of a five-year FSO contract extension and additional two seven-year time charters (four in total), providing Euronav with additional fixed income profile; a strength reflected in an upgraded return to shareholders policy to a minimum fixed annual dividend of USD 0.12 per share. Our balance sheet was further enhanced with a USD 150 million unsecured bond offering during May and augmented further with sales of older tonnage in the fourth quarter. However, the key challenge for the tanker market remains the concentration of deliveries of newbuildings in both the VLCC and Suezmax sectors. If the illness is low freight rates then the cure is low freight rates as that should drive more ships to be removed from the active global fleet. Euronav notes an encouraging recent rise in recycling activity but it needs to be sustained before an inflection point in the cycle can be reached. A dynamic year for Euronav culminated in the proposed merger with Gener8 Maritime. The merger will create the leading independent large crude tanker operator with 75 crude tankers representing over 18 million dwt and balance sheet assets of over USD 4 billion. The combined entity retains Euronav’s capital discipline with leverage of less than 50% and a liquidity position estimated at more than USD 750 million. Medium- and longer-term prospects for the tanker market remain constructive, underpinned by a solid recurring demand for crude, structural change in financing likely to constrain future vessel supply growth and a likely acceleration in the retirement of older ships from 2017 onward encouraged by environmental legislation on ballast water treatment and particularly from sulfur emissions in 2020. On 21 December 2017 the boards of Euronav and Gener8 Maritime announced agreement on a stock-for-stock merger for the entire issued and outstanding share capital of Gener8 pursuant to which Gener8 would become a wholly-owned subsidiary of Euronav (the “Combined Entity”). The merger will create the leading independent large crude tanker operator with 75 crude tankers, of which 44 VLCCs and 28 Suezmax crude tankers representing over 18 million dwt in the aggregate. The Combined Entity balance sheet assets of over USD 4 billion will have marked-to-market leverage of less than 50% and a liquidity position estimated at more than USD 750 million, including cash on hand and undrawn amounts available under existing credit facilities. Work on the transaction is proceeding as planned with an anticipated closing in the second quarter of 2018. Full details on the proposed transaction can be found on our website: www.euronav.com. A full year gross dividend of USD 0.12 per share has been recommended by management and proposed by the Board of Directors for approval at the AGM on 9 May 2018. Taking into account the interim dividend paid as of 5 October 2017, and subject to shareholders’ approval, a final dividend of USD 0.06 per share will be paid after the Annual General Meeting of Shareholders. In August 2017 we announced an upgraded new return to shareholders policy. Going forward Euronav intends to (1) pay a fixed minimum dividend of USD 0.12 per share every year (equivalent of USD 0.06 for each half year) and; (2) if the results per share are positive and exceed the amount of the fixed dividend, that additional income, as adjusted for exceptional gains (excluded) and losses (included), will be allocated to additional dividends, debt repayment or buying back shares or, of course, accretive vessel or fleet acquisitions, as the Board at that time deems most valuable for the shareholders in the long term. On January 12 and 20, 2017 Euronav took delivery of two VLCCs (acquired as resales of contract), the Ardeche (2017 – 298,642 dwt) and the Aquitaine (2017 – 298,767 dwt), from Hyundai Heavy Industries – Samho yard, South Korea. On April 20, 2017 Euronav signed an additional two long-term time charter contracts of seven years each with Valero Energy, Inc. for Suezmax vessels with specialized Ice Class 1C capability starting in late 2018. This brings to four the number of long-term (seven years) Suezmax time charter contracts the Company has within its portfolio. In order to fulfil these contracts, Euronav ordered an additional two high specification Ice Class Suezmax vessels from Hyundai Heavy Industries shipyard in South Korea. On April 25, 2017, Euronav signed a 12-year USD 110 million Export Credit Agency (ECA) financing with commercial banks and Ksure for the financing of the two VLCC newbuildings the Aquitaine (2017 – 298,767 dwt) and the Ardeche (2017 – 298,642 dwt) the Company took delivery of in January. On May 11, 2017 the General Meeting of Shareholders approved the annual accounts for the year ended December 31, 2016, as well as a gross dividend of USD 0.22 per share. On May 14, 2017 Euronav and its joint venture partner, International Seaways, signed a contract for five years for the FSO Africa (2002 – 442,000 dwt) and FSO Asia (2002 – 442,000 dwt) in direct continuation of the current contractual service. The contract was signed with North Oil Company, the new operator of the Al Shaheen oil field, whose shareholders are Qatar Petroleum Oil & Gas Limited and Total E&P Golfe Limited. On May 16, 2017 Euronav Luxembourg SA, a wholly owned subsidiary of the Euronav group, announced the successful launch of a USD 150 million unsecured bond with a coupon of 7.50% and maturity in May 2022. This was Euronav’s first entry into the debt capital markets. On June 1, 2017 Euronav announced the sale of the VLCC TI Topaz (2002 – 319,430 dwt) for USD 21 million recording a loss of USD 21 million. The TI Topaz joined the Euronav fleet in the first quarter of 2005 and contributed positively over the years to the results of Euronav, especially during strong freight rate years such as 2005, 2006, 2008, 2010, 2015 and 2016. In June, 2017 the Company started a treasury note program (Commercial Paper) and placed approximately EUR 50 million in the market for various short-term maturities at a pricing of 60 bps over Euribor. This was not additional debt but rather an opportunity to decrease the cost of borrowing by systematically using the proceeds to repay part of the Company’s revolving loan facilities. On August 23, 2017, Euronav received a transparency notification, dated August 22, 2017, pursuant to which M&G Investment Management Limited, following the acquisition of voting securities or voting rights on August 21, 2017 held 5.04% of the voting rights in the Company and thus crossed the 5% threshold. On September 8, 2017 the Global Maritime Forum of which Euronav is a founding partner was launched. The Global Maritime Forum is a global platform for high-level leaders from the entire maritime spectrum and aims to effect positive long-term change for the industry and for society. Euronav paid an interim dividend of USD 0.06 per share for the first half of 2017. This was the first payment under the new dividend policy as announced on August 10, 2017. The dividend was payable as from October 5, 2017. On October 23, 2017 the USD 150 million senior unsecured bonds issued by Euronav Luxembourg SA and guaranteed by Euronav NV were admitted to listing on the Oslo Stock Exchange. On November 8, 2017 the Company received a transparency notification from Châteauban SA, a holding company part of the CLdN-Cobelfret group whose main activities are in bulk shipments, ro-ro shipments and port companies. Following the acquisition of voting securities or voting rights on November 7, 2017, Châteauban SA held 5.15% of the voting rights in the Company and thus crossed the 5% threshold. On November 10, 2017 Euronav sold the VLCC Flandre (2004 – 305,688 dwt) for USD 45 million to a global supplier and operator of offshore floating platforms. A gain of USD 20 million on the sale was recorded. The vessel was delivered in December 2017 for conversion into an FPSO by her new owner and would therefore leave the worldwide VLCC trading fleet. On November 16, 2017 the Suezmax Cap Georges (1998 – 146,652 dwt) was sold to its new owners. The vessel was sold for USD 9 million and was delivered on November 29, 2017. The Company recorded a gain of USD 9 million. The sale of the Cap Georges came in anticipation of the delivery of the first of four Suezmax vessels early in 2018 currently under construction at the Hyundai yard in South Korea (HHI). Those vessels are part of a seven-year contract for four vessels with a leading global refinery player. 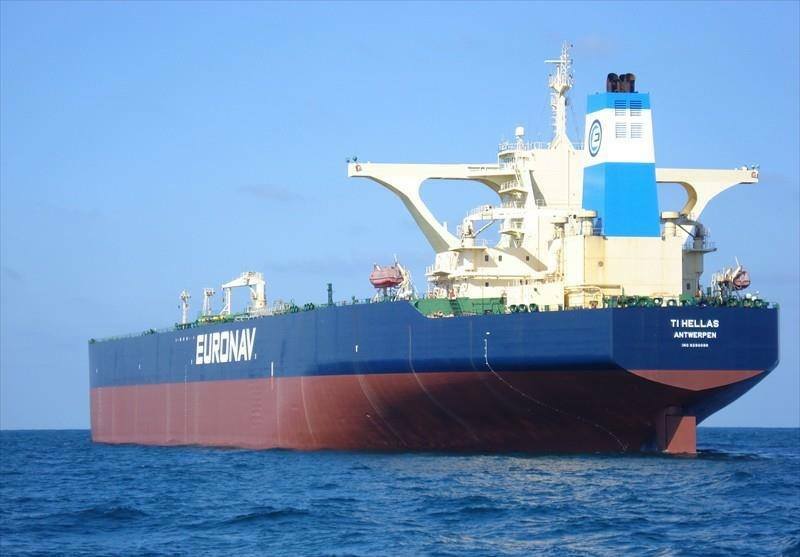 On November 17, 2017 Euronav sold the VLCC Artois (2001 – 298,330 dwt) for USD 22 million. The Artois was the oldest vessel in the Company’s VLCC fleet. The Company recorded a gain of USD 8 million on the sale. The vessel was delivered to its new owners in early December. On December 21, 2017 Euronav and Gener8 Maritime, Inc. (NYSE: GNRT) (“Gener8”)announced that they reached an agreement on a stock-for-stock merger for the entire issued and outstanding share capital of Gener8 pursuant to which Gener8 would become a wholly-owned subsidiary of Euronav. On January 23, 2018 Euronav was included in the Bloomberg Gender-Equality Index (“GEI”). The reference index measures gender equality across internal company statistics, employee policies, external community support and engagement, and gender-conscious product offerings. Euronav is the first Belgian HQ Company and only transportation or shipping company in the index. On February 1, 2018 the Company received a transparency notification from Châteauban SA, a holding company part of the CLdN-Cobelfret group whose main activities are in bulk shipments, ro-ro shipments and port companies. Following the acquisition of voting securities or voting rights on January 31, 2018, Châteauban SA held 10% of the voting rights in the Company.